The luxurious Rivage Frameless Dual-Bypass Sliding Shower Door provides a bold, unrestricted solution to your next showering experience. The Rivage's unique dual-door design provides a smooth, silent sliding operation while enabling you to access your shower alcove from either side. Its thick 3/8 inch tempered safety glass; tested and certified to ANSI Z97.1 Standard with StarCast by EnduroShield easy clean coating, ensures lasting clarity and low-maintenance care. With the Rivage frameless sliding shower door, you won't need to compromise an attractive design for functionality. Shower base not available. Images are for representation only. Once installed, glass may differ slightly than shown in image due to the nature of light absorption and reflection from your own bathroom's color, design or decor palette. This is normal and should be expected in certain scenarios due to the glass's natural composition. The DreamLine Enigma-X shower door, tub door or enclosure brings an air of sophistication and luxury with its modern and fully frameless design. The striking stainless steel hardware delivers a perfect mix of exceptional quality and cool urban style. DreamLine exclusive ClearMax water and stain resistant glass coating adds superior protection from stains and is nearly maintenance-free. Model is reversible for a right or left door opening installation. Please note: 2 person team necessary for proper installation. Drilling into the tub/threshold is required for installation of this product. 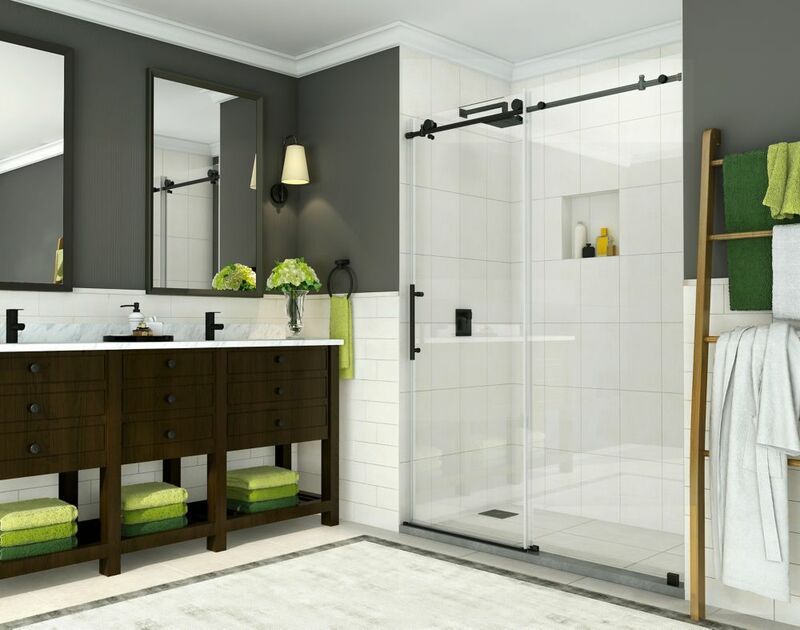 Coraline 56 inch to 60 inch x 76 inch Frameless Sliding Shower Door in Oil Rubbed Bronze is rated 4.7 out of 5 by 70. Rated 5 out of 5 by Jake1234 from Nice quality shower door. Very heavy, make sure to... Nice quality shower door. Very heavy, make sure to have two people for assembly and moving. Ours was delivered on a large double pallet. We had to disassemble the packaging and move one panel at a time because of how heavy it was. Very nice sliding movement after assembly. Rated 5 out of 5 by Paul from Heavy but well built and excellent instructions. No problems but... Heavy but well built and excellent instructions. No problems but 2 people are required. Rated 5 out of 5 by James from A contractor installed it, so can’t comment on install issues,... A contractor installed it, so can’t comment on install issues, but it is lovely and works wonderfully. No complaints. Rated 5 out of 5 by SanDiegoChef from Looks amazing in our master bathroom. Glides smoothly and the... Looks amazing in our master bathroom. Glides smoothly and the quality is high. We are so happy that we decided to purchase this shower door for our renovation. Rated 5 out of 5 by skimmy from I like the roller door eliminating the track a the bottom that collects yuck. We have had this do... I like the roller door eliminating the track a the bottom that collects yuck. We have had this door about a month and we love it's great quality and it is all we expected about the appearance for our newly remodeled bathroom.